Happy New Year from all of us at KBR. With January well underway, and many schools back this week, we couldn’t wait to sit down and reflect on the advances in technology from 2015 and bring you an insightful mini-list of emerging trends to whet your technological appetite for 2016. 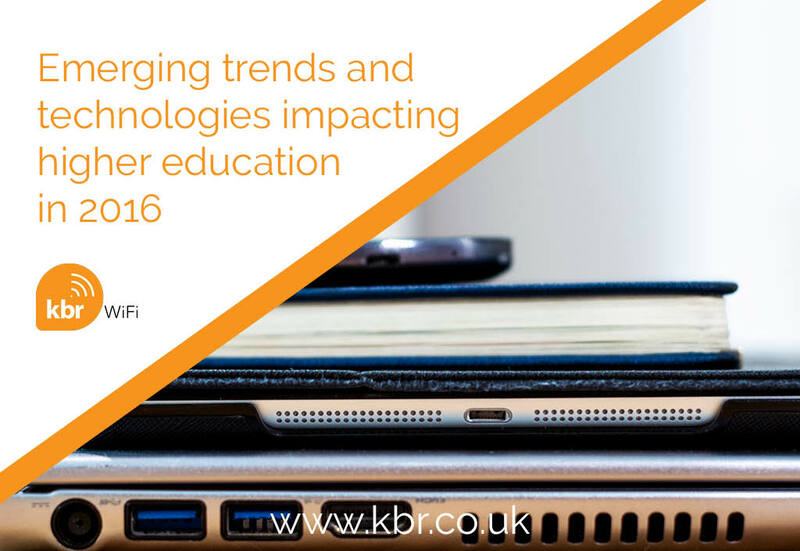 So here it is – KBR’s predictions for the top five emerging trends and technologies set to impact higher education in 2016 and beyond. We’d love to hear your ideas and comments in response to this article. The typical classroom or lecture hall set up is unmistakable: a podium or desk at the front for the teacher or instructor, along with a white board or presentation device, and row upon row, or square upon square of desks and accompanying chairs. This could all be about to change, with a ‘student centred’ approach prompting many higher education professionals to rethink the layout of their learning spaces. Schools, colleges and even universities are starting to create more dynamic classroom layouts, wherein the podium is moved to the centre of the room, or lecture hall, and is surrounded by round or oval tables with movable chairs. This will allow students to shift between groups as needed. We also predict an increase in ‘technology-enabled’ workspaces, with each desk or group having access to an interactive whiteboard or other marking surface. 3D Printers, digital signage, wearables and other interactive devices are on the rise, and this means more devices connecting to the WiFi network than ever before. Additive manufacturing or ‘3D printing’ as it is more popularly known is not a new idea, but the availability of simple to use, affordable 3D printers is set to change the way design and manufacturing industry works. As a result, more and more technology and manufacturing focused schools are considering the adoption of 3D printing technology to help young engineers and designers learn how to think, design and create in 3D. We predict more and more schools, libraries and particularly colleges and universities acquiring 3D printers, and even more wearable technology to develop these new design skills in their students. Students today can learn almost anything via the Internet. Self-directed, curiosity-based learning that was once restricted to museums, science centers, and personal learning networks has now entered the classroom. Many experts believe that a blending of formal and informal methods of teaching and learning can create a higher education environment that fosters experimentation, curiosity, and above all, creativity. We predict a gradual trend towards more ‘self directive’, with students being encouraged to work in groups, or on an individual basis to complete online learning syllabuses, allowing teachers and lecturers to use ‘classroom time’ for more interactive and group based practices, and this is supported by data. Recently, the US National Center for Education Statistics reported that one in ten students were enrolled exclusively in online courses. Studies conducted by the Babson Research Group reveal that 7.1 million American students are engaged in online learning in some form. As online learning garners increasing interest, higher education institutions are developing more online courses to both replace and supplement existing courses. It is a model currently being explored by many higher education institutions. These days, it’s a rarity to find a student without their own laptop, and even mobile phone but this is not new. Students have been bringing their own devices into schools, colleges and universities for years and years. For higher education institutions, then, ‘BYOD’ will become less about the devices and more about the personalised content that users have loaded onto them. No two devices share the same content and BYOD enables students and educators to leverage the tools that make them most efficient. In many cases, their devices are already populated with productivity apps, such as Skitch and iTunes, helping them to better organise their notes, syllabi, and schedules on campus and beyond and we predict a trend for personalising content on devices based on personal interests and learning stages. At Manchester Medical School, students use iPads during class to annotate instructors’ slides, record lectures, take notes, and create mind maps to illustrate their understanding of complex topics. Research is beginning to suggest that computer games can help to stimulate a successful learning environment and provide motivational learning contexts that suit many learners. They also provide an opportunity to develop communities in which learners have a sense of ownership over what they do. To progress in a game is to learn; when we are actively engaged with a game, our minds are experiencing the pleasure of grappling with (and coming to understand) a new system. This is true whether the game is considered “entertainment” (e.g., World of Warcraft) or “serious” (e.g., an FAA-approved flight simulator). What impact will these trends have on your educational establishment? Each key trend has numerous implications for teaching and learning practices. Universities and colleges have been gradually rethinking how their organisations and infrastructures can be more agile, for example, to promote entrepreneurial thinking but there is also a call to ensure the establishments WiFi network remains equally agile. All these great mobile and networked devices entering the school wireless network create enormous pressure to deliver consistent network performance. Teachers and students are using up a lot of bandwidth with rich media. Institutions must also deal with recreational traffic like Netflix and YouTube that threatens to overrun the network. It’s important, then, to have your institutions wireless network independently surveyed,using an active WiFi survey (often known as heat-map surveys) to ensure you deliver a reliable service for every type of mobile device you wish to connect to your WiFi network. This can include both internal coverage in classrooms and lesson preparation areas as well as out in the playground, sports field or outdoor student communal areas. At KBR, we have a long-term passion for IT in classrooms and we’re constantly testing new technology to ensure our customers have the very best WiFi access and online security to enable safe and reliable online learning and collaboration. If you’d like to know what we’d recommend, please do ask us!